Rogue traders and doorstep scammers in Surrey were targeted during a joint trading standards and police crackdown this week. Trading standards officers teamed up with the police to check vans and lorries, patrol rogue trader hotspots and pursue ongoing investigations into fraud and money laundering. A suspect in a doorstep crime incident in Ashford was identified and is helping with enquiries and evidence was gathered in a separate fraud probe in Ashtead. A total of 207 rogue trader and doorstep scam incidents in Surrey were reported to trading standards in 2016/17 – and rapid intervention by officers stopped residents being ripped off to the tune of £1.2million. 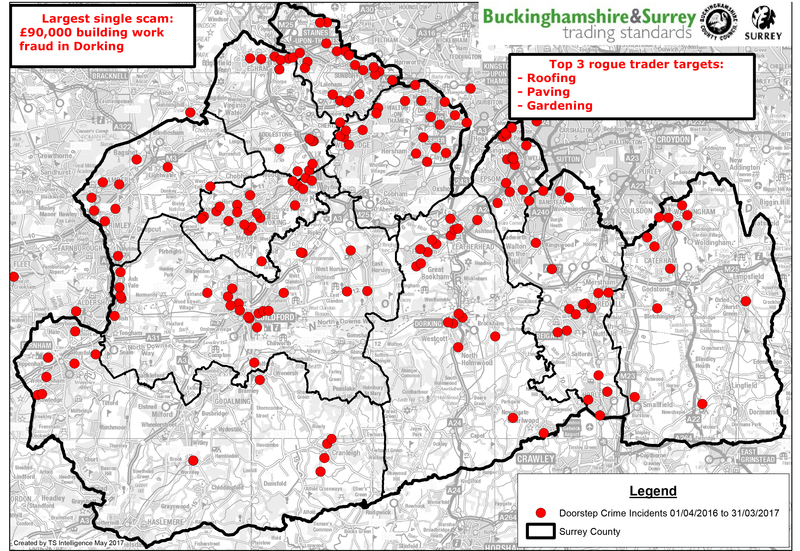 The three most common scams in Surrey involved roofing work, with 73 incidents reported, followed by paving or tarmacking, with 41 incidents reported and gardening, with 32. The highest value scam was an attempted £90,000 building work fraud in Dorking. A rapid action team of trading standards officers foiled the scam and the perpetrators are now being investigated. Officers from Buckinghamshire and Surrey Trading Standards and Surrey Police took part in a national day of action on Wednesday 10 May, known as Rogue Trader Day, which aimed to disrupt the activities of scammers who pressurise residents into sales and fob them off with shoddy work or none at all. Steve Ruddy, head of Buckinghamshire and Surrey Trading Standards, said: “Rogue traders spell misery for residents and undermine genuine businesses and our day of action with the police sends a clear message to conmen that they’re not welcome. A map of Surrey shows where doorstep incidents were reported in 2016/17 although the true level of crime is likely to be much higher as it’s known only about 10% of cases are reported. Most recorded incidents were in Reigate and Banstead and Spelthorne, both with 27, and Guildford, with 25. To report a rogue trader, contact the Citizens Advice consumer service on 03454 04 05 06.